The phrase, “the music emerged from an inky black background” has become an audiophile cliché, but after a minute of warm-up (during which you will hear some hum from the right channel), the IHA-1 is as silent, with as quiet a base noise level, as any solid-state headphone amplifier I’ve used. A silent background is even more important in headphone listening than in a room-based system where some small amount of hum and noise can be forgiven because it’s inaudible by the time you move far enough away from the loudspeakers to listen. With headphones you can’t rely on distance to reduce a system’s intrinsic noise level. When I received the first sample IHA-1, it had a hum that would not go away regardless of placement or AC wiring scheme. I returned it for a second sample. The second sample was hum-free as long as it was properly placed and connected (it was especially sensitive to noise generated by some AC power conditioners such as the EquiCore 150 balanced power conditioner, which I’ve found is best reserved exclusively for digital devices). With the PS Audio Quartet, the IHA-1 was absolutely silent when used as a line-level preamplifier or headphone amp, even with the volume control turned up all the way to full output, which is how I sometimes used it with the Grace M9xx, where I relied on the Grace’s volume control with its finer delineations to attenuate levels. 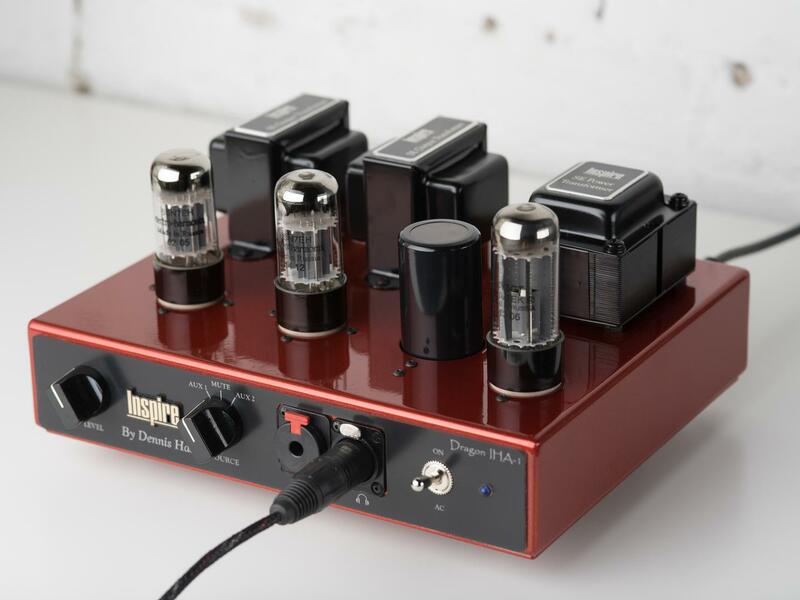 Some headphone amplifiers are designed to be general-purpose devices, with multiple gain and impedance adjustments, while others are made to work best with certain headphones that fall within a more limited specification set. The IHA-1 is definitely one of the latter. Dennis Had told me that the two headphones he used when designing the IHA-1 were the Grado PS-1000 and Audeze LCD-3. My experience is that the IHA-1 is better suited for medium- and low-sensitivity headphones than anything with sensitivity greater than 90dB. With higher-sensitivity in-ear monitors, the IHA-1 has a noticeable hiss that obscures low-level details. Some of the headphones that were too noisy for my tastes included the Oppo PM-3, Audeze EL-8, and virtually every in-ear monitor in my collection. Once you eliminate all the higher-sensitivity headphones that don’t mate well with the IHA-1, you’re still left with a plethora of ’phones that do. Among those that worked successfully with the IHA-1 were the Sennheiser HD-600, Sennheiser HD-700, Audeze LCD-2, Beyer Dynamic DT-990 600-ohm version, HiFiMan HE-560, Beyer Dynamic DT-880 250-ohm, AKG K-7xx, AKG K-553, Grado RS-1, AudioQuest Nighthawks, Mr. Speakers Alpha Primes, and Audio Technica ATH-A900x. Once it is mated with a headphone for which it is suited, the IHA-1’s midrange liquidity and innate harmonic beauty will roll over you like a fifty-foot wave. The IHA-1’s midrange is lush without sounding thick, fast without losing lower-midrange body, and immensely musical. But like all single-ended designs, this midrange purity comes at a price—less control and definition at the frequency extremes. While I found the IHA-1’s treble response exhibited no noticeable sonic failings, its bass response was fluffier and less incisive than more conventional tube and solid-state headphone amps I’m familiar with. I call this “marshmallow bass.” Headphones with large suspended planar drivers had the most noticeable issues from the IHA-1’s lack of low bass damping, but on other headphones, such as the AKG K-7xx, the differences in low-bass presentation were reduced. The three-dimensionality of the IHA-1’s soundstage, especially when the unit was coupled to a spatially incisive headphone such as the HiFiMan HE-560 or the Grado RS-1, was something akin to wandering around in a huge hall that just happened to be inside and around your head. And while even the “lowly” O2 headphone amplifier can deliver precise lateral imaging and a decently sized soundstage, the IHA-1 takes that lateral image specificity and adds another dimension—depth—and then explodes the soundstage outward, leaving plenty of room for the spaces between the notes as well as among the instruments themselves. With most solid-state headphone amplifiers the balanced output has double the voltage swing of the single-ended output because it is using two amps (one in positive polarity and one with inverted polarity). The IHA-1 does not double the voltage swing because it uses the same amp, creating the balanced signal with its transformer-coupled output. By the very nature of the output transformer, a balanced signal appears at the secondary output winding so there is no need for a phase inverter or second amp section. Given that the balanced output does not offer additional voltage, I found that using a balanced cable instead of a single-ended one from the same manufacturer (Wireworld) resulted in no audible differences between the two connections with all three headphones I used for this test—the AudioQuest Nighthawk, Sennheiser HD700, and Audeze LCD-2. When I used the IHA-1 as a preamplifier, I was most impressed with its soundstaging and imaging characteristics. When compared to the Grace m9xx’s preamplifier section, the IHA-1 produced a slightly larger stage overall with remarkably specific three-dimensional imaging on phase-coherent recordings. I was also captivated by the IHA-1’s lack of background noise or low-level hum. Finally, the IHA-1’s bass was not as soft and fluffy when used as a preamplifier. Although the IHA-1’s midbass was slightly less taut than that of the Grace m9xx, on some selections I preferred the IHA-1’s softer yet fuller bass response. The perennial question in the tubes-versus-solid-state amplification debate is whether tubes are subtractive, removing some amusical energy that solid-state passes on to your ears, or if tubes merely have fewer additive distortions than comparable solid-state devices. Depending on the particular tube and solid-state circuits involved, the answer could be either or both. But when used in an optimal setup, with a high-performance headphone, the IHA-1 makes a strong sonic argument for a single-ended tube design as a lower-distortion (when not stressed) and less sonically pernicious technology.